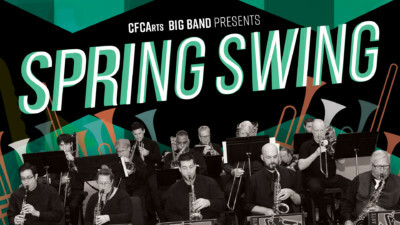 The CFCArts Big Band is one of the newest offerings in CFCArts diverse lineup of ensembles. The Big Band was formed in the Spring of 2017 and has become an attraction for those individuals who enjoy playing music associated with this genre. The band’s repertoire covers the music of Stan Kenton, Count Basie, Buddie Rich, Quincy Jones, Alan Baylock, just to name a few. Our intention is to entertain our audiences by playing music of all styles. The Big Band rehearses every Sunday evening from 5- 6:30pm at Calvary Orlando. The group utilizes trumpets, saxophones, trombones, piano, bass (acoustic and electric), guitar, and drums. Jazz improvisation and musical experience performing in this style of ensemble is not a necessity for membership. Those individuals with the ability to improvise will find that they have an outlet in this organization. Amateurs and professionals who enjoy jazz ensemble music and who wish to join others with the same interest will find a home in the CFCArts Big Band. This is a non-auditioned group for those that are 18 years of age or older. Any questions regarding joining or playing in our organization may contact Priscilla Greenough at 407-937-1800, Ext. 708 or via email at orchestra@CFCArts.com.